How to chit potatoes, especially earlies and second earlies. Before planting your potatoes, its good to get them off to an early start, so they go on to produce large, healthy plants and hopefully a bumper crop. The best way to do this is a process called chitting. Seed potatoes will be available in the garden centre or despatched from mail order companies from January. You can start to chit potatoes from the end of January in the south and February in colder areas. If you look at your seed potato, you'll see that it has a rounded end and a slightly pointed end. If you look at the rounded end you'll see small eye's developing. These ultimately grow into the plants stems and leaves. 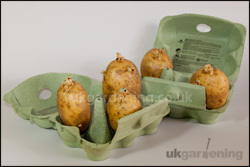 Chit potatoes by standing them, on their ends, with their eyes uppermost, in egg trays/boxes or seed trays, in a cool but frost-free, dry place with natural light a greenhouse or by the window in a garden shed/summer house is ideal. Remember to keep different varieties in separate trays, or with sheets of cardboard to separate the varieties and don't forget to put a label in with the potatoes, so you can identify them when planting out. Planting them out when the shoots are a few centimeters long, around six weeks after chitting (mid-March to early April).